The Secret Houses of Yang are what makes Taijiquan great. This is what distinguishes the 'red herring' Tai Chi from the real thing. What makes a silly, 'you push me, I push you' tai chi into a real fighting self defence system. These houses were what the Masters taught only their most treasured and trusted students and or family members and even went as far as giving us all the wrong information to stop us from getting the 'family jewels' as Yang Sau-chung once told me. Why is it that we are told that Tai Chi ch'uan means 'Supreme Ultimate Fighting' when we are taught this silly thing of Pushing Hands? Why would you want to do that? You do not push each other in real fighting. 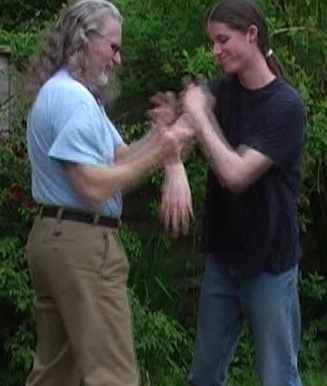 This way of pushing hands was also a red herring to keep us off the trail of the real thing of 'Joining Hands', which is the way that we are taught how to fight in Tai Chi.